As the dust settles from the 2014 municipal election and political commentators begin to reflect on what happened, two common themes are emerging. First, there seems to be universal disappointment in the lack of turnover on council. Only one sitting councillor was defeated which is seen as further evidence that incumbents essentially have a “job for life” due to name recognition and lazy voters. Second, there has been endless chatter about the length of our municipal elections. Many pundits are calling for a shorter election period, with statements such as “why do we need a ten month municipal election, when our federal elections are only five weeks long?”. Both of these reflections are overly simplistic, lazy, and essentially wrong. In this post today, I’ll address the myth of the five week election campaign. Next week, I’ll post about the myth of eternal incumbency. The mythical “five week election” is based on our federal election rules which require a minimum of 36 days for the election period, and the provincial rules which require only 28 days. At first glance it would seem as though our municipal elections are roughly eight or ten times longer. “That’s absurd!” you might think. You’d be wrong. In fact, you’d have your facts completely backwards. The truth is, our municipal campaigns are actually shorter than our provincial or federal campaigns. Here’s why. Municipal candidates aren’t allowed to fundraise until the election period starts, ten months before election day. So if I want to run for city councillor in 2018, I need to wait three years before I can raise a single penny, or spend a penny. That means that for the next three years I can’t produce any flyers, organize public events, maintain a website, etc. But if I want to run in the provincial election in 2018, I have access to pools of money throughout the next four years. First, each riding association is allowed to raise as much money as they want, any time, any year. They can organize events, design materials, and do mail-outs at anytime. Second, during the nomination period (and there is no limit to how early this can happen), I’m allowed to personally raise as much money as I want, on my own nomination campaign. I can spend that money of posters, videos, websites, and mailings. I would be building name recognition and building my organizational base, far before the actual “election period” begins. The third pool of money is the official campaign budget. Unlike a municipal election, there are loopholes that allow a campaign to raise and spend money well before the election starts. For example, my riding association can simply ‘transfer’ money to my campaign, even though they raised that money before the election period. Lastly, I also benefit from the largest pool of political money around: the central spending of the party. Which brings us to…. Comparing our ten month municipal election to our alleged “five week federal campaign” ignores an obvious difference. Parties! As I stated earlier, those who want to run for city council in the next election aren’t allowed to spend a penny until January 2018. Meanwhile, all the major parties are spending enormous amounts of money every single day on promotions, staff, design, marketing, media relations, public events, database management, polling etc. All this, despite the fact that we’re not in the middle of an “election.” For example, new campaign commercials are released almost every month by the Conservatives, Liberals, and New Democrats. These parties raise, and spend, millions of dollars in between elections. Which means, essentially, they are always campaigning. (Note: this applies not only to provincial and federal elections, but also for party-based local elections as well, in cities such as Vancouver and Montreal). If we had parties at the municipal level, if we had separate legal entities such as riding associations that were allowed to raise and spend money in between elections, if we had municipal nomination campaigns with no spending limits whatsoever, then we could compare our local ten-month campaigns with our five-week federal campaigns. But in the current context, the simple truth is that our municipal campaigns are actually much shorter than their provincial and federal counterparts. However, there’s one exception to this rule. One small group of municipal candidates are allowed to skirt the rules and spend money before the election period begins. In fact, their publicity campaigns are funded publicly, by the taxpayers, promoting the candidates for four years. These are, of course, our city councillors. While all aspiring candidates have to wait until 2018 to raise a penny, or even photocopy a simple leaflet, our 44 councillors will be mailing us flyers, calendars, and fridge magnets for the next four years, each piece of material guaranteed to prominently feature their name and charming photograph. Here’s another piece of data worth looking at: each municipal ward has, on average, 60,000 residents. That’s a lot of voters to connect with during a campaign. While provincial and federal candidates (and municipal candidates in Montreal and Vancouver) can rely heavily on their party brand and party leader to help secure votes, local candidates have to rely solely on personal connections with voters, built by knocking on doors and talking to residents one-on-one. Think about that: trying to connect with 60,000 people, at their doorstep. That takes a very long time. To be specific, it takes about ten months. And let me point out again, that provincial and federal parties can knock on your door anytime with glossy materials or mail endless amounts of materials, any day. If we reduce the municipal election period, that would mean that new political challengers have even less time to raise money and spend money. Even though they are already currently faced with the shortest campaigning period it would become even shorter. All the while, the incumbent councillors are metaphorically knocking on our doors with glossy pictures of themselves and/or mailing promotional materials to our homes, paid for by taxpayers. Knowing this, it shouldn’t come as a surprise to find out who is actually pushing for shorter campaign periods. It’s the Association of Municipalities of Ontario (AMO), the same folks who also successfully pushed to change our municipal council terms from three years to four. AMO represents elected City Councillors and Mayors all across Ontario, so it makes sense that they would like to see fewer elections and shorter campaign periods. But it’s our job, as citizens, to make sure that we’re informed about these proposals and the facts that lurk behind over-simplified sound bites. While you may not see it, the political machines that drive election campaigns are churning each and every day. 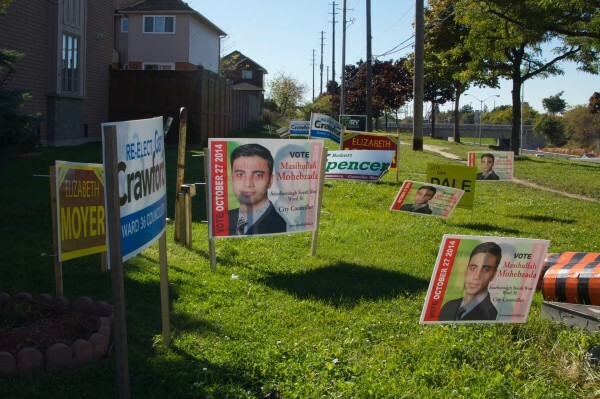 Provincial and federal campaigns begin years before election day, and elected councillors get to communicate with potential voters for four solid years before the next election is held. The only candidates in Canada who are currently restricted from raising money and campaigning before the election period, are municipal candidates in non-partisan elections. So when you hear someone say “It only takes 28 days to elect a new provincial government, why do we need ten months to choose a new Council?”, tell them they’ve got it backwards. Largely correct, wrong only here: “Municipal candidates aren’t allowed to fundraise until the election period starts, ten months before election day. So if I want to run for city councillor in 2018, I need to wait three years before I can raise a single penny, or spend a penny.” This is not correct. Municipal candidates can spend as much money as they like self-promoting before the election period. They just don’t get any contribution refund for doing so, unlike money raised and spent during the election period. If Dave Meslin wants to spend ten million dollars today putting out “Meslin for Mayor 2018” signs across the city, he can do that, there’s no law against it. But the city won’t give him any refund for that spending. At federal and provincial level, the party-affiliated candidates can raise and spend tax-advantaged contributions any time. NON-party candidates are truly screwed – can only raise tax-advantaged contributions for a week or two during the campaign. At the municipal level, mayor and city councillors (including non-party-affiliated challengers, few though those may be) can raise partly-refunded contributions for the ten months. Trustee candidates NEVER get any refunds. Thanks for your thoughts. So, how does that work? If I spend ten million dollars of my own money, putting up election signs before Jan 2018, I wouldn’t be breaking any rules about campaign spending limits?? That doesn’t sound right to me. I’ve never seen a municipal candidate produce any materials before the nomination period begins. Can you clarify how that money relates to the overall spending limit? There are ways to bypass the rules. You CAN start a campaign website before registering. You start a website where you blog about your community activities. You talk about ranked ballots and everything else. Keep doing this until January 1, 2018. 9am – wake up, shower. 10:45 – arrive at city hall (taking into consideration that you take 30 minutes for breakfast, 45 minutes to get to city hall). 3 days later at 9am – your website goes back up as campaign website. You just attend community events in whatever ward (or across city if you run for Mayor) you want to run in. You can campaign without campaigning. Thats what incumbents do. They will all be campaigning for 2018. Get your name out, it’s all about name recognition. > If I spend ten million dollars of my own money, putting up election signs before Jan 2018, I wouldn’t be breaking any rules about campaign spending limits?? Campaign spending limits only apply during a campaign! And the campaign starts, for municipal elections, when you sign up to be a candidate, and not before. The campaign does _not_ start when you start telling your friends, “hey, I might run for Mayor this year”. Campaign spending limits still have pretty good “teeth”, despite this apparent loophole, because a) candidates want to take advantage of the contribution refunds and b) the most crucial time to spend money is just before election day. Money spent prior to that is not as effective. Your $10 million “Dave for Mayor” campaign, executed now, will have been forgotten by most voters by the time the 2018 election rolls around. But yes, I am slightly surprised that Toronto hasn’t had a Mike Bloomberg type – a truly wealthy individual who could indeed spend an extra million $ prior to September 12 and then also max out on the $1.3 million spending limit from September 12 through election day. The Fords are not quite wealthy enough to qualify. Note that if you spend money BEFORE you are a candidate for advertising happening AFTER you are a candidate, that’s not allowed – so you can’t pre-buy ads to run the day before the election, and so on. You have to count your pre-existing inventory of brochures and signs and whatnot against the spending limit when you become a candidate. But if you spend money BEFORE for brochures delivered BEFORE, or radio ads played BEFORE, or TV ads played BEFORE, that’s fine – it’s not a campaign activity, no part of it happened while you were an official nominated candidate.